Almost twenty-nine years after the first episode of ‘Time and the Rani’ showed the Sixth Doctor regenerating into the Seventh while collapsed on the TARDIS console room floor above the planet of Lakertya, ‘The Brink of Death’ finally details the events- with Colin Baker’s direct involvement as opposed to earlier written accounts- leading up to that harrowing change as the Doctor must confront the Valeyard one final time and make the ultimate sacrifice to save his personal future, his companion, and all of Time Lord history. A malfunction results in the TARDIS landing on Zastros 9 instead of the intended Zastros 8, but when the Doctor attempts to find and rectify the problem, he instead finds himself trapped within the Matrix, the repository of all Time Lord knowledge used to predict future events. The Gallifreyan technician Genesta happens upon him against all odds and prevents him from being deleted, but with the Matrix insisting he is a rogue programme and continuing its hunt for him with only six minutes until total erasure once it catches him, the more pressing question becomes just why the Matrix insists that the Sixth Doctor is currently traveling in his TARDIS with Melanie Bush, a Doctor who carries the Valeyard’s visage and who everyone implicitly accepts as the real item. Such a monumental release requires a monumental villainous plan, and the Valeyard unquestionably delivers, at first seemingly channeling the Monk in ‘The Secret History’ by taking the place of the Doctor but in actuality going beyond even the Master’s ultimate aim in the two parts of the ‘The End of Time’ as he seeks to use the Matrix to take the place of every Time Lord from throughout history to craft Gallifrey’s culture and thus the universe in his own image. The script easily bounces between locations as the Doctor’s time continues to run out and he tries to piece together the evil plan using his intimate knowledge of his own TARDIS as well as Genesta in whom he recognises a kindred spirit to help, and the means by which elements from the previous three serials slot into the events portrayed here gives a very cohesive feeling to The Last Adventure as a whole as the symbiotic nuclei of the TARDIS and the Valeyard’s furtive visit to obtain specific volcanic gas from a very unique planet that turned its moon into a power plant become interminably interlinked. The Valeyard was introduced in ‘The Ultimate Foe’ as an amalgamation of the darker sides of the Doctor’s nature taken from somewhere between his penultimate and final incarnations. The Eight Doctors suggested that the High Council brought him into existence, and the Valeyard truthfully or not suggested in ‘The Trial of the Valeyard’ that he was created as a Time Tot while the Doctor sought a means of subverting the twelve-regeneration limit as his own demise neared, and so there has always been at least some degree of ambiguity around this malevolent force. Here, Genesta- who may or may not have been Valeyard all along and whose claims remain unverified- discovers that the Valeyard was created as a black ops weapon. This doesn’t necessarily change the history of the Valeyard, but it is odd that such an audacious notion would be brought up without a more substantial exploration of the claims, especially if this is the Valeyard’s final defeat as certainly seems to be the case. Regardless, Michael Jayston once more gives a profound performance that exudes charisma and unadulterated evil with no hope of redemption, and his character’s fierce intelligence and determination to survive and propagate however unnaturally are superbly realised. With Liz White so wonderfully bringing Genesta to life alongside the Doctor as he seeks to regain control of his own timeline, Melanie Bush is much more of a background character than might be expected for what amounts to her final chronological tale with the Sixth Doctor at her side. 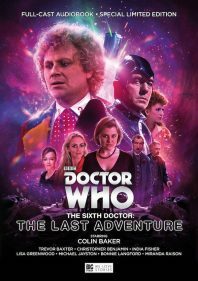 This isn’t necessarily a detriment to the story being told since she certainly serves her role in the plot by providing the necessary exposition and extra impetus for the Doctor’s action, but so prominently featuring her on the cover art of The Last Adventure above the many other companions depicted suggests that more of the superb character work Big Finish has done with Mel over the years would bleed through into this release. Still, even in her brief time allotted, Bonne Langford is captivating as Mel continues to demonstrate an implicit trust in the Doctor no matter the potential oncoming dangers he describes. With the Eighth Doctor and the War Doctor both having their regenerations revealed for the fiftieth anniversary, the Sixth Doctor officially remained the only past incarnation to not have the actor involved in an official regeneration story. ‘The Brink of Death’ represents some seventeen years of steady Big Finish development and rehabilitation of this Doctor who was so unfairly maligned during his tenure on television, and Colin Baker gives arguably his most profound performance yet as sheer panic and desperation begin to combat the character’s usual confidence and bravado. With the ultimate sacrifice the only course of action, ‘The Brink of Death’ is everything a regeneration story should be despite Langford’s minimized involvement, highlighting the incredible range of Colin Baker while gloriously proving just how much he has simultaneously changed while remaining the same fundamental man who burst onto the screen in ‘The Caves of Androzani’ before his future self guides his inevitable change.